Syria is suffering. One of the most prominent of the evils that assail her is ISIS. Religious fanaticism has sparked sexual slavery, crucifixions, decapitations, warfare, and a refugee crisis that is finally forcing everyone to see the humanity and vulnerability in the midst of the carnage. But Syria might have had an entirely different history if its people had preserved the teachings brought there over 21 centuries ago by a secular humanist missionary known as Philonides. Hailed by NewEpicurean.com as an unsung hero, Philonides of Laodicea (200-130 BCE) was sent to Syria by the Scholarch of the Epicurean Garden in Athens to convert Asians to the naturalist philosophy of the atomists, marking a curious time in Hellenistic history when Greek humanists were sending secularizing missionaries to the Middle East. He lived in the Seleucid court and greatly influenced the royal family there, converting some to Epicureanism, and kept a vast library of philosophical works. There, he taught philosophy to Antiochus IV Epiphanes, and according to Life of Philonides—a Herculaneum scroll—he converted Antiochus’ nephew King Demetrius I Soter. Together with his company of scholars, he helped to bring about the Hellenistic Era in Judea and was so highly esteemed that he was employed as ambassador, and stone monuments were erected to him. The brilliant satyrist Lucian of Samosata would eventually emerge from the Syrian communities of Epicurean philosophers that were nurtured in this environment. Philonides was a prolific scholar, publishing more than a hundred books and collecting writings for the royal library. 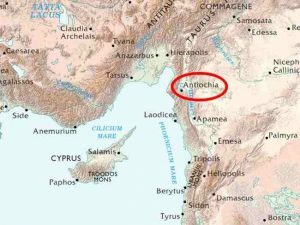 It was thanks to his work that, according to Norman DeWitt in his St. Paul and Epicurus, Antioch would eventually become a major center of Epicureanism. In this book, DeWitt demonstrates that many of the writings of St. Paul can be understood as a reaction against Epicurean teachings, and that Saul of Tarsus was so familiar with these teachings that he must have studied the philosophy in depth at one point. Philonides lived during the generation that saw the rise of the Macabees, which inaugurated two decades of battle between fanatical Judaism and the Hellenizing forces in Judea. He also lived during the generation that saw the Hellenized Saducees—who, like the Epicureans, denied the afterlife–become one of the prominent Jewish sects. There is much speculation on how much Epicurean philosophy may have influenced their doctrine, particularly their denial of an afterlife. The fact that later Jewish tradition would use the term apikorsim as a derogatory word for Pagans bears testimony on the challenge posed by the intellectual life that Philonides sparked in the region. It’s a sad irony that today, the Middle East—and Syria, in particular—is still inundated with superstition, fear-based religious fanaticism and violence. Its history and its present would have been much more glorious and peaceful if it had kept and fiercely defended Philonides’ secular ethics. This entry was posted in History and tagged laodicea, philonides, syria on November 15, 2015 by Hiram.